The Green Workplace: Wireless Power. Yeah... POWER! How annoying is it that we're completely mobile with our laptops, phones and PDAs -- but tethered to power cords. I can't tell you how many times I've paced up and down the concorse at the airport looking for a plug. And when there is one, it's nowhere near a convenient place to sit, so I'm squished on the floor between six other poeple in my (what was) clean suit. 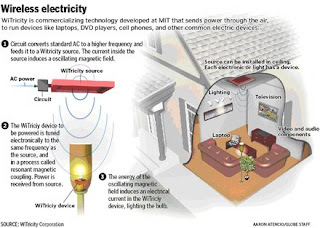 MIT physicists recently invented technology that can light a 60-watt light bulb at several meters. The concept of "resonant energy transfer" -- where the same principles used in electrical transformers are used to send electricity over a long distance -- was created when a professor was awoken three nights in the row by a cell phone whose battery was dying. He wondered "Why can't all this electricity in the walls just come out and power my phone?" "WiTricity" works using the principle of inductance, where an electric charge is stored in the form of a magnetic field in a coil of a conductor. Two such coils, resonating at the same frequency, can exchange charge across space. This is not radiative power transfer -- since it uses only magnetic fields. Here's an image from WiTricity's website that helps explain.